Feeding disorder of infancy or early childhood is characterized by the failure of an infant or child under six years of age to eat enough food to gain weight and grow normally over a period of one month or more. The disorder can also be characterized by the loss of a significant amount of weight over one month. Feeding disorder is similar to failure to thrive, except that no medical or physiological condition can explain the low food intake or lack of growth. Infants and children with a feeding disorder fail to grow adequately, or even lose weight with no underlying medical explanation. They do not eat enough energy or nutrients to support growth and may be irritable or apathetic. Factors that contribute to development of a feeding disorder include lack of nurturing, failure to read the child's hunger and satiety cues accurately, poverty, or parental mental illness. Successful treatment involves dietary, behavioral, social, and psychological intervention by a multidisciplinary team of health professionals. Feeding disorder of infancy or early childhood can occur with inappropriate parent-child interactions, such as failure to read the child's hunger cues or forcing food when the child is not hungry. Lack of nurturing and/or parental aggression, anger, or apathy can make eating a negative experience for the child, increasing the risk of feeding disorders. To meet criteria for a true feeding disorder of infancy or childhood, these medical conditions must be ruled out. Because the child or infant with a feeding disorder is not consuming enough energy, vitamins, or minerals to support normal growth, symptoms resemble those seen in malnourished or starving children. 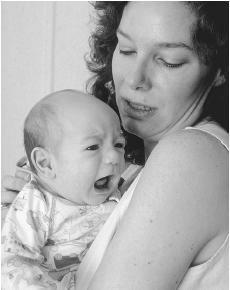 The infant or child may be irritable, difficult to console, apathetic, withdrawn, and unresponsive. Delays in development, as well as growth, can occur. In general, the younger the child, the greater the risk of developmental delays associated with the feeding disorder. Laboratory abnormalities may also be associated with the disorder. Blood tests may reveal a low level of protein or hemoglobin in the blood. Hemoglobin is an iron-containing substance in blood that carries oxygen to body cells. This mother is consoling her new baby. Infants who are not nurtured, or whose caregiver becomes angry or are apathetic at feedings are more likely to develop feeding disorders. Although minor feeding problems are common in infancy and childhood, true feeding disorder of infancy or early childhood is estimated to occur in 1% to 3% of infants and children. Children separated from their families or living in conditions of poverty or stress are at greater risk. Mental illness in a parent, or child abuse or neglect , may also increase the risk of the child developing a feeding disorder. Failure to eat adequately over one month or more, with resultant weight loss or failure to gain weight. Inadequate eating and lack of growth not explained by any general medical or physiological condition, such as gastrointestinal problems, nervous system abnormalities, or anatomical deformations. The feeding disorder cannot be better explained by lack of food or by another mental disorder, such as rumination disorder. The inadequate eating and weight loss or failure to gain weight occurs before the age of six years. If feeding behavior or weight gain improves when another person feeds and cares for the child, the existence of a true feeding disorder, rather than some underlying medical condition, is more likely. Successful treatment of feeding disorders requires a multidisciplinary team approach to assess the child's needs and to provide recommendations and education to improve feeding skills, behavior, and nutrient intake. The multidisciplinary team for treatment of feeding disorders in childhood usually includes physicians specializing in problems of the gastrointestinal tract or of the ear, nose, and throat; a dietitian, a psychologist , a speech pathologist, and an occupational therapist. Support from social workers and physicians in related areas of medicine is also helpful. Behavioral therapy can help the parent and child overcome conditioned feeding problems and food aversions. Parents must be educated to recognize their child's hunger and satiety cues accurately and to promote a pleasant, positive feeding environment. Changing the texture of foods, the pace and timing of feedings, the position of the body, and even feeding utensils can help the child overcome aversions to eating. If poverty, abuse, or parental mental illness contribute to the feeding disorder, these issues must also be addressed. Colin D. Rudolph and Dana Thompson Link. "Feeding Disorders in Infants and Children." Pediatric Clinics of North America 49 (2002): 97-112. After reading this write up, Im suspecting my daughter could be affected by this condition. Shes exclusively breast feed. Taking her weight over a two month period, march and May 2016 indicate no significant weight gain.she weighed 6.5kg on march 31st and 7.3kg on May 31st. Shes five months old. Pls suggest how I can tackle the situation.